The Sedona pen is designed for comfort, style, and function with its classic Euro design. 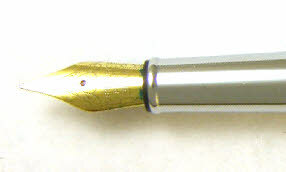 Fountain pen comes with a converter and an iridium point nib. In the last 15 years the fountain pen has been growing in popularity at an astonishing rate. Today fountain pens are used less as an all day pen of choice (except by lawyers and judges) but serve as a signature pen, a special letter or note pen, and for keeping a journal.